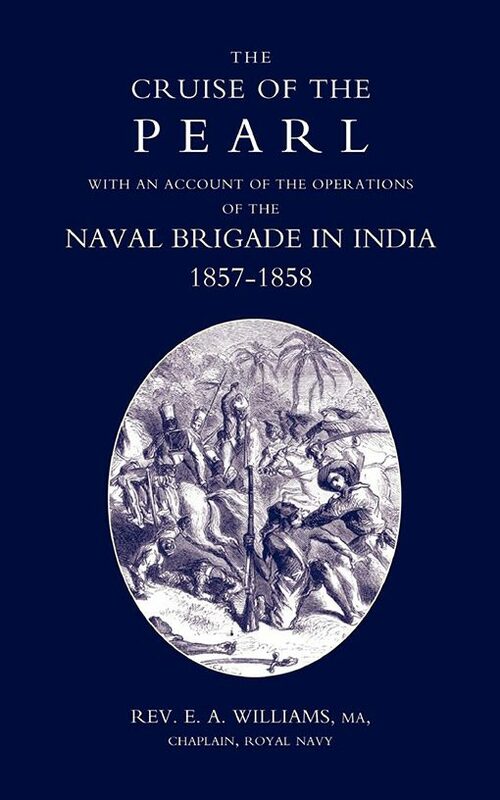 Drawn from the unusual diary of a naval Chaplain detailing the exploits of a scratch Naval Brigade, consisting of warship crews fighting on shore, in quelling the Indian Mutiny in 1857-58. Charming, despite the grim nature of much of the material. An exciting account of a unique episode in the Indian Mutiny of 1857-58. As the author, who was naval Chaplain aboard ‘H.M.S Pearl’, says in his introduction: ‘This is, I believe, the only example in English history of officers and seamen of the Royal Navy leaving their ships, and taking their guns seven or eight hundred miles into the interior of a great continent, to serve as soldiers, marching and counter-marching for fifteen months…and taking an active part in upwards of twenty actions’. The crews of the ‘Pearl’ and the ‘Shannon’ were in Calcutta on a round-the-world show the flag tour when the Mutiny broke out. Pressed into shore service as the Naval Brigade, and serving alongside Gurkha regiments and the Bengal Yeomanry Cavalry, the sailors took part in the Battles of Phoolpore,Belwa, Amorha, Hurrreah and Toolseepore and other exhausting actions. In Williams’ words ‘It was a brutalizing war in which quarter was neither given nor received’.